1: Understanding word clouds? – In order to use Wordle you must understand the basis behind a word cloud generator. As described earlier, a word cloud generator actually counts the number of times a specific word has been used in a document. It takes those words and makes them larger in size according to their frequency of use. This is great for the obvious use of looking at a document and getting a pictorial representation of that document. Think of the documents that you and your students can have great discussions over! 2: Making a word cloud? – First find some text you wish to make a word cloud of and make sure you make a copy of it. Next go to (http://www.wordle.net/). Believe it or not… you are half way finished. Click on “Create Your Own”. You will see a box to paste the text you had copied earlier. Scroll below… and hit submit. Within a few seconds you will have your own Word Cloud. Use the controls to make it look the way you like. 3: Saving a word cloud – Wordle does not provide a way to save but there are ways around that.. Of course you can print it… but then you may want an electronic copy. The best way is to us one of these techniques. In Windows you can always hit the Print Scr button. Next open up Word, Open Office, or graphics program such as Paint and paste it in. Use the cropping tool in that program to get what you want. With a make it really is the same process. In Windows 7 you may wish to use the Snip It Tool which gives you a lot more options including the ability to save as an image and crop. Last, remember I said you could print. Use a program such as Adobe Acrobat Acrobat or the free CutePDF Writer. Now you even have a digital print file! 4: Make word clouds setting your own word sizing – Wordle will let you create word clouds that allow you to emphasize certain words. Examples: 1.You wish to have a word cloud with names of mammals with the word mammal in large letters. 2. You wish to show a word cloud of endangered animals with larger letters showing larger population and smaller letters showing smaller populations. There are actually two methods. Method One: Words you wish to have larger will require you to type (or copy paste) multiple times. The larger you wish the word to be… the more it is typed in. Make sure you always leave a space between words. The size of a word in the visualization is proportional to the number of times the word appears in the input text. So, for example, if you type “mouse cat cat dog dog dog” into the create page’s text field, you’ll see that cat’s font size is twice mouse’s, and dog’s font size is 3/2 that of cat’s. Wow… do I see a math lesson? Method Two: Use the Advanced Wordle which can be found at http://www.wordle.net/advanced. There are some advanced Wordle users that do not even know this exists. It is well worth your time to discover! It really is quite simple. You must type in the word, followed by a colon, followed by the number (no spaces). You must hit return after each entry so that each word is on its own line. Want to pick you colors and backgrounds? 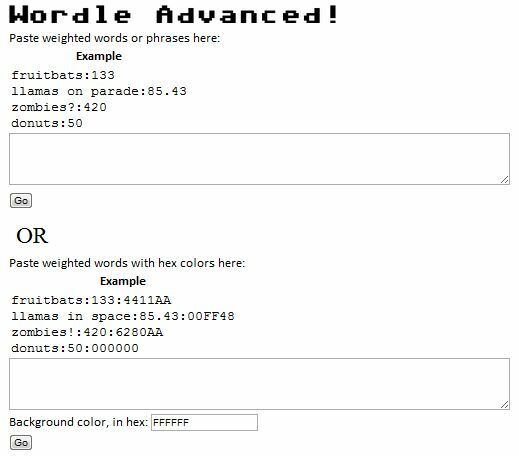 There is even a method for that and take a look at this link to understand hex colors… it really is easy! I have provided a picture below to show Method Two. 6: Making numbers show up – Wordle has a setting that automatically removes the numbers. Perhaps you wish to keep your numbers. In fact this might be helpful in math, or using a tilde when giving a word with a quantity. This is very easy. Once you make the Wordle you will see a Menu sho up. One of the items is “Language”. At the very top of the language menu you will see “Remove Numbers” is checked (it is the default). Click and uncheck it and notice… your numbers will now show up! 7: Include all words entered in the word cloud – Wordle likes to eliminate some of those common words it refers to as a “stop word” (a frequently-used, but unimportant word, such as “the”, “and”, or “but”). Once again go to the “Language Menu” once the Wordle has been made. You will see a command that says, “Do not remove common words”. Make sure it is checked and all of your words will show up. 8: Capitalization of words – Wordle sets as the default the exact way you capitalize your words. This could mean no letter is capitalized, the first letter is capitalized, the first two letters are capitalized, or even the last two letters are capitalized. You can use the “Language Menu” after making your Wordle to change this. You have the option of making all letters capitalized, not capitalized, Wordle’s guess of capitalization, or the way you entered the word. Think of the language arts lessons on proper and common nouns! 9. Counting each word occurrence – Yes… Wordle will amazingly count the number of times each word was used and give a read out of this. This could be valuable in investigating word frequency and analyzing text and speeches. Think of the possibilities! After making a Wordle you will find at the bottom of the “Language Menu” a tool called “Show Word Counts”. Just click on it and you will see an awesome table! 10. Changing fonts, colors, and layouts – You can have so much fun changing any of these. Make sure you discover all the possibilities after making your Wordle. You will find these opportunities in the Drop Down Menus: Fonts, Colors, and Layouts. You can spend hours making it look just the way you wish. If you don’t like your last change… just go to the Edit Menu and click Undo!